It was a typical evening in Denison, Iowa, when I stopped by the Hillside Grille Steakhouse, but I wasn’t there for the food, and this was no ordinary gathering. I had been invited to meet an authentic American hero, but I was afraid he’d be tired. Col. Gail Halvorsen, 97, had flown into the Omaha airport on May 2, 2018, with his daughter late that afternoon from his home in the western United States. Turns out I didn’t need to worry about the energy level of this famed World War 2-era pilot. As soon as I sat down at the table near him at the Hillside Grille around 7:45 p.m., the “Candy Bomber” flashed me a big smile. I knew this was going to be good. 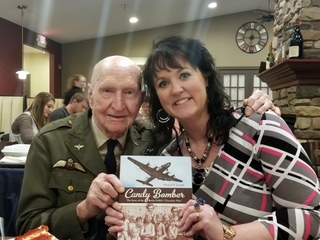 I had known it a few days earlier when my friend Vance Lundell, owner of Lundell Plastics in Odebolt, mentioned that the Candy Bomber was coming to western Iowa and invited me to meet the legendary pilot. To understand the Candy Bomber’s story, let’s go back to 1948. World War 2 was over, but the war’s aftermath continued to ravage Europe. Life was especially grim in Berlin, Germany, which had become a divided city within a divided country. The Soviets were attempting to cut off Western access to West Berlin, which was located deep inside Soviet-controlled East Germany. Soviet leader Josef Stalin blockaded all ground routes coming in and out of Berlin to cut off West Berliners from all food and other essential supplies. The blockade against the Western Allies threatened to crush a city that was already struggling against starvation. Without outside help, more than 2 million people might die. In response, the United States and the United Kingdom launched the Berlin Airlift, a humanitarian rescue mission to airdrop food into West Berlin. Halvorsen was part of this effort. Not only did he help provide nourishment to the people of West Berlin, but he also gave the children a reason to hope for a better world—and it also started with two sticks of gum. Halvorsen, like scores of other Western pilots, had been working 12 to 15 hours a day to deliver food and supplies at Berlin’s Tempelhof Airfield (which is now a public park) like clockwork. But only Halvorsen had an unlikely inspiration that would end up making him famous. When he encountered some German children lingering at the edge of the air field, he offered two sticks of Wrigley’s chewing gum before departing. When he saw the excitement this small offering generated, the pilot promised to drop candy on his next flight. When the children asked how they would know which of the huge airplanes was his, Halvorsen said he would wiggle his wings as he approached their position. “Uncle Wiggly Wings” was born. Halvorsen lived up to his promise and inspired other pilots to donate their candy rations. Halvorsen started dropping chocolate, gum drops and other candy out his plane’s window as a treat for the emaciated Berlin kids often huddled together on the edge of the airfield. He even used spare handkerchiefs to rig up a little parachute for each load so the candy wouldn’t be squashed upon impact. “Operation Vittles” evolved into “Operation Little Vittles” as the Candy Bomber delivered candy and good cheer to the children of the blockaded city. After newspapers got wind of what was happening, tons of donations of chocolate and other candy donations began pouring in from across America. Halvorsen had not only put a face on the Berlin Airlift, but he bolstered the U.S.’s humanitarian mission during the Cold War by enlisting the American public. This was no small miracle, considering that Americans who had grown weary of continued food aid for Europe eagerly embraced the opportunity to give candy and chocolate to German children. From one thoughtful, generous act came a lifelong friendship between the Candy Bomber and the children of Berlin. Halvorsen’s remarkable story is preserved in a number of books, including “Mercedes and the Chocolate Pilot,” a children’s book that tells the true story of a seven-year-old girl named Mercedes who lived in West Berlin during the airlift and still stays in touch with the Candy Bomber. In fact, the Candy Bomber has been preparing to return to Germany this June for another visit with friends he made all those years ago. Maybe I shouldn’t have been surprised. Nothing seems to slow Halvorsen down—at least not for long. An hour and a half after I had arrived to meet him at the restaurant in Denison a few weeks ago, Halvorsen showed no signs of fatigue, even though it was well past 9 p.m., and he’d been busy giving media interviews and meeting new friends that evening. When I asked Halvorsen how he was doing, his reply “I’m ready to go!” wasn’t a plea. It was a confident, spirited answer conveying his zest for life and his love of adventure. His Iowa adventure continue the next morning when he spoke to students at the school in Odebolt before flying home. I want younger generations to know that thanks to Halvorsen’s efforts and those of his fellow pilots, the Allies held on to West Berlin and maintained support back home for the Berlin Airlift. By 1949, the Soviets lifted the blockade, and land delivery of food resumed.